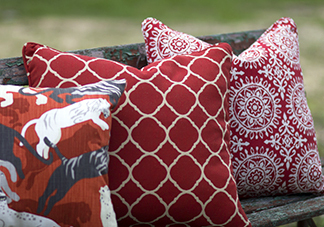 We offer a variety of fabrics for custom cushions, drapes, pillows and more! Select your topic of interest from our list below for more information regarding care and cleaning. After purchasing a piece of upholstered furniture, it is important to know proper cleaning methods to ensure your item maintains its new appearance for years to come. By following a few simple cleaning tips, you can obtain the maximum amount of use out of your couch, chair or ottoman. *For specific brands, such as Sunbrella or Robert Allen, please consult our individual cleaning instructions below or the fabric manufacturer's website. When cleaning your upholstery, use a cleaner that also deodorizes, is safe for your fabric and does not contain any harsh chemicals. Also, be sure to lightly brush or vacuum your furniture prior to cleaning. This will prevent dirt from entering the fabric while you clean. Apply cleanser to stains. When cleaning, do not rub or scrub the fabric too harshly. Use a damp sponge or cloth to remove the remaining cleanser after a minute or two. After cleansing, be sure your fabric dries thoroughly. To dry your furniture more quickly, leave a window open or run a fan nearby. 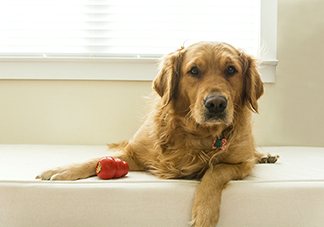 Consider using a cover to protect your furniture if you have animals or small children. This will help you avoid stains. Once a week, remove dirt from the fabric by lightly brushing or vacuuming your upholstered piece. This will prevent dirt from entering the fabric and assist in preserving its appearance. Turn or reverse the cushions on your furniture often so they wear evenly. This will also allow you to notice stains sooner. If you do observe a stain, remember to clean upholstered furniture with the weakest solution possible. While dry cleaning is recommended, there may be instances where you prefer to hand wash your silk item. In these cases, follow these guidelines to ensure your silk retains its appearance. Test for color fastness prior to washing. To do so, place a small portion of the silk in lukewarm or cold water. Afterwards, place white cotton fabric over the silk and press a warm iron. While there a faint mark is okay, do not wash if there is any other transfer of color from the silk to the white fabric. Do not bleach, bleach or boil your silk items. Use cleansers designed for delicate lingerie to hand-wash light colored silk in warm water. Use hand hot water at least three times to rinse thoroughly. Remove surplus water by placing your silk item in a dry, clean towel. Do not leave you silk in wrinkled condition. Allow your silk item to dry in a space away from direct sunlight or heat. Once the material is evenly damp, press your silk with a cool iron. Be sure you do not apply too much pressure over seams. Do not use a steam iron or try to re-dampen your silk. Finish off lightly on the right side. Because dark colors are obtained by adding coloring matters, color fastness cannot be guaranteed. Therefore, it is important to be cautious with darker hues. It is important to care for your Sunbrella fabrics properly so they remain their original appearance. Avoiding a need for deep cleaning is as easy as removing dirt before it enters the fabric, cleaning up spills as soon as they happen and eliminating stains as quickly as possible. After all, Sunbrella fabrics have a special finish, which boosts water repellency and is designed to last for many years of use. It is recommended that mild or natural soaps be used for general, light, spot, and heavy cleaning. By "spot and natural soap" we mean Ivory Snow, Dreft, or Woolite. These gentle soaps rinse out easily and will not diminish the water-repellent "finish" applied to the fabric. Remember to use cold water, spot clean only, and allow the fabric to air dry. Do not put shells or cushions in the washing machine. See the Sunbrella fabric Stain Chart for recommended cleaning solutions. Immerse fabric in a solution of ¼ cup mild soap per gallon of lukewarm water. Use a sponge or a soft bristle brush as needed. Allow your item to air dry. Use a spray bottle to mist your fabric lightly with mild soap and water. Gently scrub with a sponge or very soft bristle brush to remove stains. Rinse completely to eliminate all soap residue. To remove excess water, use a wet-vacuum or blot the area. Air dry. If needed, repeat steps three and four until all residue is removed. While Sunbrella fabric does not support the growth of mildew, mildew may exist on dirt and other substances if they are not removed from the fabric. Mix 1 cup bleach, 1/4 cup of mild soap, and a gallon of water. Place the stained area in the mixture for 15 minutes. With a sponge, clean towel or very soft bristle brush, gently scrub the area. Rinse thoroughly to remove any residue. Allow your fabric to air dry. *If stain and/or mildew are severe, bleach quantities may be increased. 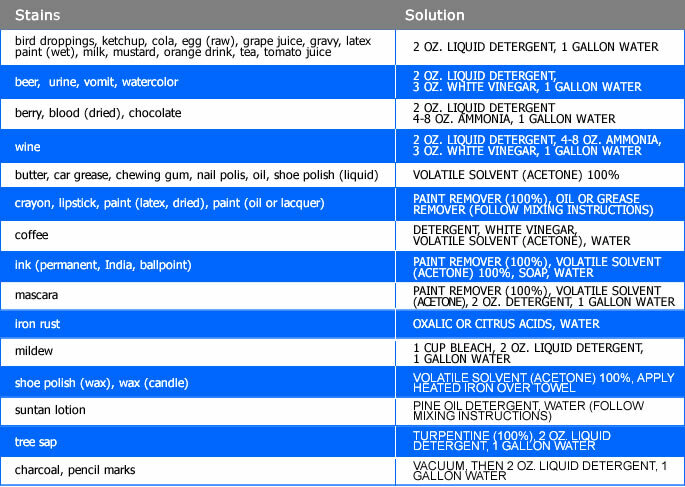 See the Sunbrella Stain Chart for removal of specific stains. When using a bleach mixture around your Sunbrella fabric, be sure to protect the area. Bleach may dye non-Sunbrella fabrics. Also, wash your Sunbrella fabrics completely to remove all bleach and soap residue. 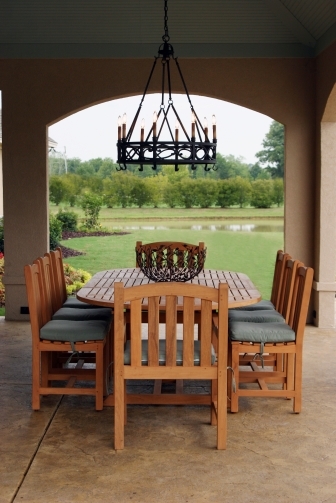 In addition, because Sunbrella fabrics air dry quickly, it is not necessary to machine dry. If you are troubled with wrinkles, use an iron with a "synthetic fabric" heat setting. Otherwise, it is recommended you do not use a steamer or an iron with a steam setting on your Sunbrella fabrics. Remove any dirt by lightly brushing the material. Mix 2 ounces of mild soap and a gallon of lukewarm water. To clean your fabric, gently scrub with a sponge or a soft bristle brush. Soak your fabric within the mixture. Make sure you completely rinse your fabric to eliminate any residue. Using a spray bottle, lightly mist your fabric with cleaning solution. Gently scrub the stained area with a sponge or a very soft bristle brush. Be sure to rinse the entire area to eliminate any residue. Remove excess moisture by blotting the area with a soft, clean towel or sponge. If necessary, repeat steps one through four until stain is removed entirely. Mix 8 ounces of bleach, 2 ounces of mild soap and a gallon of water. Spray the entirety of the fabric and allow the mixture to soak properly. Use a soft bristle brush, sponge or clean towel to scrub the area forcefully. Afterwards, be sure to rinse the area completely to remove any residue. If stain and/or mildew are severe, bleach quantities may be increased. See the Sunbrella Stain Chart for removal of specific stains. If you choose to use a professional cleaner for your Sunbrella fabric, ask about their experience with cleaning and re-treating Sunbrella fabrics. In most instances, you should not dry clean your Sunbrella fabrics. By maintaining the appearance of your Robert Allen fabric and following a few guidelines to ensure it is properly cared for, you can prolong its use and prevent wear. Protecting from the Sun — Because window glass magnifies the sun's rays regardless of the season, it is important to protect your fabrics from the sun. One option is to employ trees and shrubbery to help eliminate sunlight. Otherwise, draw your shades during the day or use awnings when possible to block the sun's rays. In addition, colors can also fade through oxidation, or gas fading, so it is important not to keep your Robert Allen fabrics in storage for a long period without airing it out. If you are using Robert Allen fabrics for draperies or curtains, line and interline to prevent fading. Vacuuming — It is important to vacuum your Robert Allen fabrics often to remove dust and other substances. Also, try to dry clean your fabrics at regular intervals so impurities do not collect. Do not try to remove any spots or stains yourself. Heating and Cooling Vents — Because most fabrics breathe and retain moisture, few fabrics are constant. This often results in fabric stretching or shrinking as much as 3 percent in length. To prevent even greater changes, do not place your fabrics around heating and cooling vents. Dry Cleaning — While a finish does not eliminate the necessity of properly caring for fabrics, the often help fabrics resist spotting. Generally, light colors are likely to benefit the most. However, if a stain occurs, it should be given immediate attention by a professional dry cleaner. To avoid dirt from collecting, regularly clean your Outdura fabric. By simply removing excess soil by lightly brushing your fabric or washing the area with tepid water, you can increase the lifespan of your fabrics. See the Outdura Stain Removal Chart. To uphold the appearance of your indoor furniture, brush often, clean spills as they arise and spot-clean stains. If you wish to hand wash your removable covers, soak the fabric in a gallon of lukewarm water and gently scrub using a sponge or brush. If necessary, add a ¼-cup of mild soap. Be sure to rinse the area completely to remove all residues and allow your fabric to airy. Mist upholstered fabrics with water and mild soap to spot clean. If needed, gently scrub with a sponge or brush. Rinse the piece completely to eliminate all residues and then allow the fabric to air dry. If desired, you may also blot or use a wet-vacuum to decrease drying time. To clean more thoroughly, gently scrub your fabric with a mixture of lukewarm water and a mild natural soap, such as Ivory brand soap. Afterward, Rinse the area completely to remove any residue. To remove stubborn stains or mildew, mix 1 cup of bleach, ¼ cup of mild soap, and a gallon of water. Allow the stained area to soak for 20 minutes prior to gently scrubbing with a sponge or clean towel. Be sure to rinse the area thoroughly and allow the fabric to air dry. Do not dry clean or steam your Outdura fabrics. When necessary, use an iron with use an iron with a synthetic fabric heat setting. For light cleaning, mix ¼ cup of mild soap and a gallon of tepid water. Allow the mixture to soak the fabric. Be sure to rinse the area completely and allow your fabric to air dry. To spot-clean a removable cover, mist the area with a mixture of water and mild soap, then scrub forcefully with a sponge or brush. Rinse the area completely to remove all residues, then allow the fabric to air dry or blot dry with a wet-vacuum. To remove stubborn stains and mildew, mix 1 cup of bleach, ¼ cup of mild soap, and a gallon of water. Allow stained area to soak for 20 minutes prior to gently scrubbing the area with a sponge or brush. Afterwards, be sure to rinse completely to remove all residues and air dry your fabric.